Here's a groundcover with great eye appeal that's perfect for filling in any bare spots in the summer landscape. 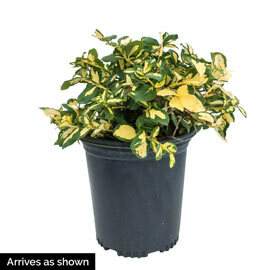 Your Moonshadow Euonymus will arrive at your doorstep in a gallon pot that is ready for immediate planting. 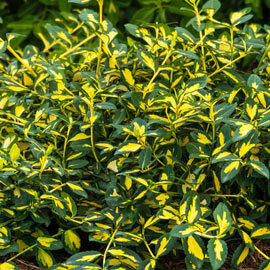 Known for its brilliant foliage, Moonshadow Euonymus bears glossy leaves with vivid yellow centers and deep green margins. In the fall and winter, the leaves take on a lovely pink tint. 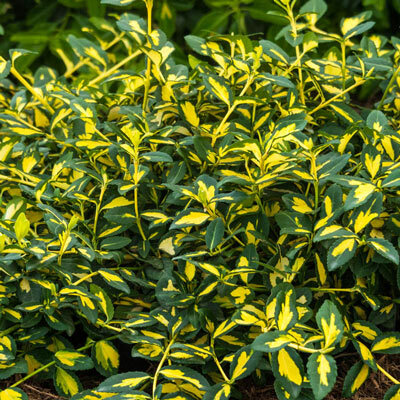 Grows 12-24 inches tall—the perfect height for jazzing up a garden bed or as a ground cover. Grows best in full sun to partial shade. Potted. Zones 5-8. Foliage: Evergreen leaves approximately 1-inch long, variegated. Dark green margins surround bright yellow centers. Flower Form: Flowers with yellow centers and very light green margins. Pruning: Pruning can be done in spring or summer, if needed. Prune to keep the plant clean or to maintain the desired shape.